This is part four of the journey on The Road to Service Financial Management. This is the last stop of our journey – in the previous stops on this journey; the Anatomy of a Service Portfolio, Building Complete Services and How to Unlock Service Value Using Cost Models, we explored some of the lesser understood concepts of service management and cost models that set the stage for how to leverage services to show value and change the dialog with your customers and partners. This leads to a service investment mindset that places IT (or any organization for that matter) at the table with business leaders for more meaningful discussions that focus on what services they want to buy instead of why IT costs so much. In this article we are going to explore some pathways to success that provide value through quick wins and targeted approaches to financial management that aligns with your organizational needs. In life there are challenges and many life paths to choose from. Not all take us where we want to go, even though they look promising when we start. When faced with challenges, most of us seek guidance to help us get on the right path. The same concept applies to Service Financial Management. Every organization has a unique set of challenges and there are many paths to consider. Depending on organizational challenges and the vision for the future, appropriate pathways are necessary to achieve success. Starting out with an assessment of the challenges and opportunities is critical to getting on the right path. We often see organizations jump into projects with good intentions and take pathways that look good on the surface, but quickly run into a quagmire of complexity that ends badly. Understanding the vision, desired outcomes and planning accordingly leads to success. Here are some common approaches that build on one another and can be used as a starting place when considering the best approach or path for your organization. Most organizations have a business need or pain point that can be addressed using a targeted quick win approach. Even in situations where complex issues are being addressed, developing a quick win approach is a great way to get started and build some momentum early in the project. An example of this might be to create a cost model that shifts expense from a functional resource based approach like tracking and reporting on network engineering staff costs, to a network access cost model that bundles costs for bandwidth and infrastructure along with people costs that are combined into single charge based on how much bandwidth is being consumed. Functional cost transparency is a good starting place for organizations looking to move from a general ledger approach where costs are categorized in big buckets (salaries, benefits, depreciation, amortization, maintenance, property, telephony, etc.) to more traditional technology aligned cost buckets (compute, storage, network access, applications, etc.) This approach provides a pathway to cost transparency at the functional technology level and can be used as a foundation for further development of transparency efforts or to address specific pain points. It typically includes a cost model to enable show back and can include a budget forecasting capability with allocations, cost roll-ups and supporting rationale that helps you to defend departmental costs. 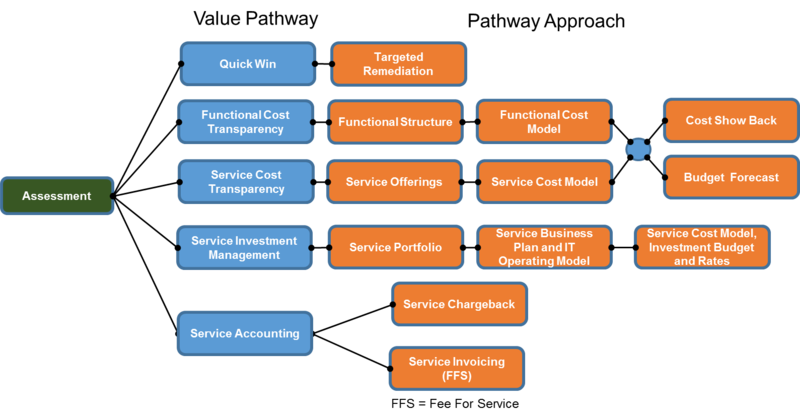 The service cost transparency pathway adds a layer of cost modeling that provides better connections to your customers by reorganizing what you do into what you sell. Many organizations struggle with financial management because they do not have a good understanding of what they sell to their customers or what their customers believe they are buying. provides a simple example of this approach for a storage service. 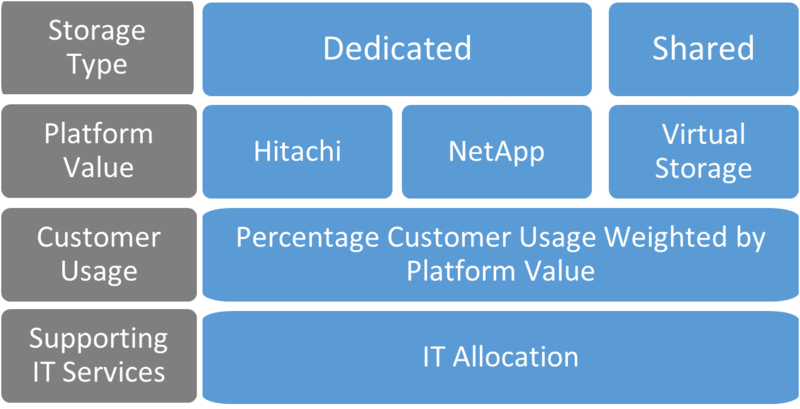 In this model, customers are consuming either dedicated or virtual storage. Platform values are determined (hardware, software, network, maintenance, depreciation) and then customer usage is calculated and a percentage allocation is determined based on use. Additional support costs including staff are allocated per internal allocation methods. This is presented as a cost show back or for budget forecasting. Customers now see cost based on the services they consume. The service investment management pathway leverages a fully functioning service portfolio and builds an investment based operating model with linkage to business planning and investment budgeting. This includes partnering with business leaders to understand business strategies and aligning them to the service portfolio (service strategy), which provides the most appropriate mix of services for the organization. Services are defined and offered based on business and customer needs with differentiated capabilities and service levels. Service providers sell their services internally to each other and externally to their customers. Supply and demand is managed by the service provider based on industry competitive prices (benchmarks). This option includes a budget forecast aligned to investment plans and service demand with specific buy-sell decision activities. The service accounting pathway adds capabilities that allow you to charge for services provided. This includes a “chargeback” capability that aligns internal costs to services provided to customers through cost models and allocations. Customers are charged for forecasted services (and use) based on budget planning activity. Organizations can also enable a “fee for service” type mechanism that includes a creation of an invoice with actual charges based on services used. This can include linkage to general ledger, asset, utilization, and service fulfillment data. A P&L statement can also be enabled. The value paths are best viewed as guidelines for planning and are typically implemented in iterative phases. It is likely that more than one iteration will be necessary to get to the maturity and business outcomes desired. Value paths can also be customized with different offerings based on the business problem and associated opportunities. The key to success is understanding where you want to go by developing a vision, assessing gaps and opportunities, and then picking a pathway that will lead you to success. Hopefully you enjoyed the journey down The Road to Service Financial Management and are better informed through this series of blogs to start your own journey. There is a right path for you. You just have to start.